Get ready for an immersive game that gives you 60 minutes to escape. The year is 1955, and you’ve been wrongfully sentenced to life in prison. While the clock is ticking, and the warden is at a meeting, you’ll be challenged to solve clues and escape. It’s a great choice for groups of friends, as you can play with up to 8 participants, and you won’t have to worry about it being too easy, as it has a 9/10 difficulty rating! 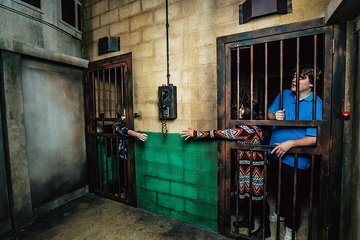 The Prison Break Escape Room is certainly not for someone who isn't on their toes looking for clues. It is mind boggling...especially toward the end. We were working together really hard to find what was important and what wasn't. There is no way to describe the urgency when you see that hour clicking away slowly! It's definitely worth your time to book an Escape!